In a penetrating globe injury, measurement of intraocular pressure is contraindicated to avoid applying pressure on the globe. If the intraocular pressure is measured the contents of the globe may extrude onto the cheek. In young children where the extent of intraocular injury cannot be assessed because of poor cooperation, the physical exam can be performed under conscious sedation with the support of an ophthalmologist. Keep the patient NPO (not eating anything) in the event that surgery is required. Place an eye shield over the affected eye (see Image C), and obtain a computed tomography (CT) scan of the head and orbits (coronal and axial views) to evaluate for open globe injury, intraocular foreign body, and orbital wall fractures. An orbital foreign body that may have perforated the globe should be left undisturbed until surgery. A rupture of the globe may present with enophthalmos (recession of the globe within the orbit) and orbital crepitus, an indication of subcutaneous emphysema potentially from an associated sinus fracture. Document tetanus immune status and update as indicated. An open globe laceration is considered a tetanus prone wound. Ophthalmology consultation and referral is mandatory, and the patient needs to be admitted or transferred. 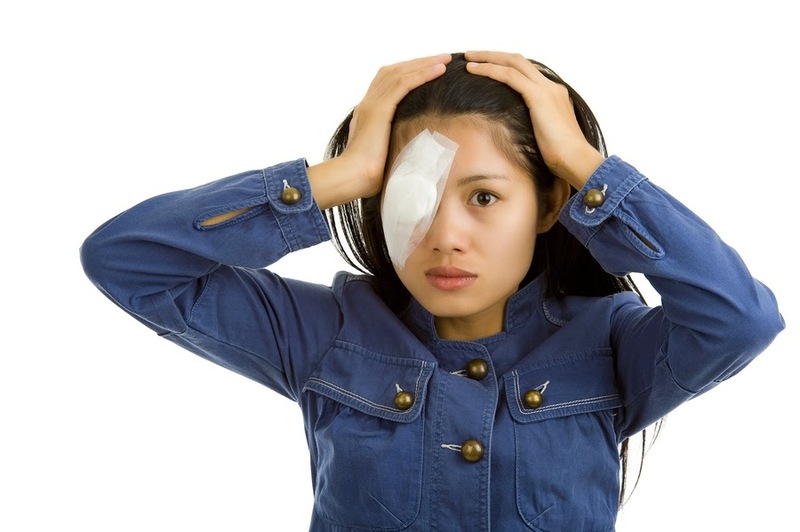 The involved eye is kept shielded with no patch, and the patient is put on bedrest until a definitive care plan is established. Overall, when talking about ocular emergencies the rapid diagnosis, treatment, and correct referral are the ultimate determinants of the patient’s ocular well-being and prognosis. 1. Khare, G.D., Symons, A., & Do, D.V. Common Ophthalmic Emergencies. International Journal of Clinical Practice 2008; 62(11), 1776-1784. Available from http://www.medscape.com/viewarticle/583742. 2. Acerra J, Drone S. Globe Rupture Clinical Presentation. Medscape. March 2014.available from http://emedicine.medscape.com/article/798223-clinical#a0217.Accessed October 23, 2014. 3. Nickson C. Eyes Wide Split. Life in the fastlane. 2011. Available from http://lifeinthefastlane.com/ophthalmology-befuddler-013/ . Accessed October 23, 2014. 4. Goldberg, S., & Trattler, W. Ophthalmology Made Ridiculously Simple. Miami, FL: MedMaster, Inc.; 2012. 6. 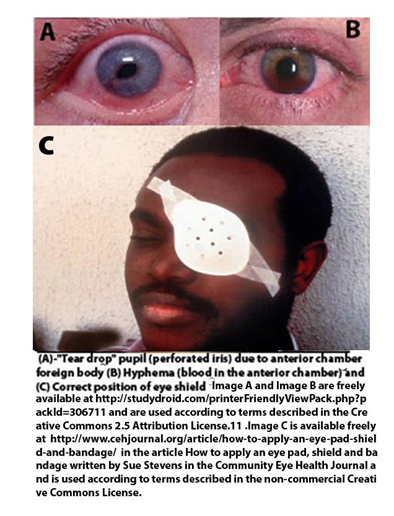 Kuhn F, Pieramici D. Ocular Trauma Principles and Practice. In: Chaudhry N, Flynn H ed. Endophthalmitis. 1st ed. New York , NY: Thieme Medical Publishers, Inc; 2002:296. 7. Limkakeng A, Schaider J .Globe Rupture. In: Schaider J, Barkin R, Hayden S, Wolfe R, Barking A, Shayne P, Rosen P, ed. Rosen & Barkin’s 5-Minute Emergency Medicine Consult. 4th ed.USA: Lippincott Williams & Wilkins; 2010. 8. Palay D, Krachmer J. Palay & Krachmer: Primary Care Ophthalmology, 2nd ed. USA: Mosby, An imprint of Elsevier; 2005. 9. Information for Healthcare Professionals: Fluoroquinolone Antimicrobial Drugs [ciprofloxacin (marketed as Cipro and generic ciprofloxacin), ciprofloxacin extended-release (marketed as Cipro XR and Proquin XR), gemifloxacin (marketed as Factive), levofloxacin (marketed as Levaquin), moxifloxacin (marketed as Avelox), norfloxacin (marketed as Noroxin), and ofloxacin (marketed as Floxin)]. August 15, 2013. Available at: http://www.fda.gov/Drugs/DrugSafety/PostmarketDrugSafetyInformationforPatientsandProviders/ucm126085.htm. Accessed January 26, 2015.